In RP59 we printed material by the Edinburgh Campaign Against Poverty. It not only does fine work helping individuals facing persecution, and campaigns against employers taking advantage of slave labour, but does it with a critique of capitalist society. There ought to be more groups like this just now. Shortage of space forbids us printing much this time but this is part of their latest leaflet (see picture for their web address). 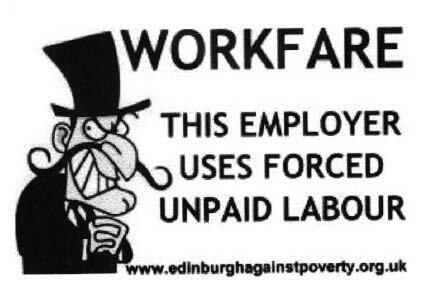 WORKFARE – BACK TO THE POOR LAW! More and more companies are being shamed into ending their involvement in workfare – Holland and Barrett, one of the latest, join TK Max, Sainsburys, Waterstones, Burger King, HMV, Boots, Body Shop, and many others, including increasing numbers of charity shops. Collective action against such attacks works! But many companies are still using the scheme - they need to be exposed and challenged. Get involved in our actions against these companies; don’t let them make you feel isolated and helpless.